Originally posted to Korn Ferry Institute on February 25, 2019. There’s saying “no” to your boss, and then there’s what Kepa Arrizabalaga did in an English soccer title game that’s drawn international attention. In the waning minutes of a tense game between powerhouse soccer clubs Chelsea and Manchester City, the manager of Chelsea felt his goalkeeper, Arrizabalaga, was hurt and had to come out. But the player would have none of it. Arrizabalaga refused to come off the field, the manager fumed, and Chelsea went on to lose. Sound familiar? The stakes and dramatics might not be as high, but corporate leaders certainly hear protests to their decisions all the time—and even outright refusals. It’s a tricky proposition for any boss, but experts say it can create an opportunity for the firm when handled well. According to Kevin Cashman, a Korn Ferry leadership coach, leaders can hear “no” from an employee and use it as a way to create value for everyone. 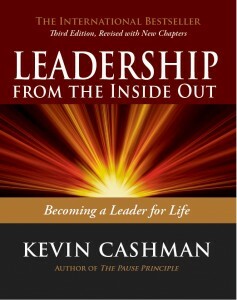 “Bosses have to be open, self-aware, and agile enough to know that they may be wrong at times,” Cashman says. But letting direct reports refuse orders at the wrong time—or in the wrong way—not only jeopardizes the boss’s reputation but also can damage the organization as a whole. Originally posted to City National Bank’s News & Insights blog on February 4, 2019. Ambitious business owners and professionals want to leave their mark on the world, but they’re often too busy to answer an important question: How do you want to be remembered? It’s worth the time and effort to consider what contribution you want to impart to your company and people — whether it’s a new way of thinking, learning or doing. A powerful legacy also enables a leader’s influence to continue well into the future. Many business owners may begin thinking about their legacy as they prepare to exit their company, but it’s just as important for leaders to create a living legacy — one that is built throughout your career, not just at the end. Not only will building a living legacy provide purpose throughout your career, but getting clarity on your legacy early on can be an effective way to help you set goals and priorities, said Kevin Cashman, global leader of CEO & Executive Development at organizational consulting firm Korn Ferry in Minneapolis. By Kevin Cashman; originally posted on his Forbes blog: Pause Point on January 15, 2019. One of the toughest development challenges is to elevate a critical mass of talent from executive management to true enterprise leadership. To move key talent from controlling systems, processes and financial performance to courageously create value creating significance, sustainability and purpose across an enterprise is no easy task. To move senior people from thinking and behaving downwards into a function, a geography, a division or a single team, to thinking, and collaborating and inspiring across all functions, across all geographies, across all divisions, across all teams and across all customer groups is a very complex and critical shift. Accelerating the development of executive managers into enterprise leaders may be the single most important factor in achieving your strategy and creating a more valuable and sustainable future. By Kevin Cashman; originally posted to his Forbes blog, Pause Point on December 28, 2018. Although it may be true that we can’t “step into the same river twice,” as Heraclitis said, once we step in, we are part of that river’s flow. Since birth, we have been swept up in a raging, constantly changing never-ending flow of experience. Sometimes we love the flow of life, sometimes we hate it and resist it. But because the flow of the river is constant, we have no choice in the matter. We have to change. It is part of the price of admission to life. Every moment our cells are changing; our thoughts are changing; our emotions are changing; our relationships, our marketplace, our finances. Change is endless and relentless. We have no choice in the matter except for one aspect—accelerating our growth through change by adapting and learning. Most leadership research illustrates that as we go up the executive ladder, we need to become increasingly comfortable with uncertainty and sudden change. As leaders, we have to have the “integrative ability” to weave together and make sense of apparently disjoined pieces, crafting novel and innovative solutions. At the same time, we need to have the self-confidence to make decisions on the spot, even in the absence of compelling, complete data. The qualities needed at the top—courage, openness, authentic listening, adaptability—also indicate that leaders need to be comfortable with and able to embrace the “grayness” that comes from multiple points of view coming at us at once. In other words, we have to master our adaptability mentally, emotionally, strategically, and interpersonally. By Olive Keogh; originally published in The Irish Times on November 9, 2018. Earlier this year Renault Nissan Mitsubishi Alliance chief executive Carlos Ghosn had his contract renewed for another four years. But rather than continuing to run the business day to day, Ghosn (64) has a new job: succession planning. Ghosn runs a tight ship and has been the public face of the alliance for almost 20 years. He’s a tough act to follow but it’s interesting to see that his focus at this point is on identifying potential leaders from within his own organisation. There are good reasons to promote from within. It costs less, it retains staff, it keeps expertise in-house, it protects the corporate culture and it sends a positive message about career opportunities. However, it’s also potentially risky. If someone unexpected gets the job, it can really upset the status quo as those who thought they were a shoo-in are disappointed. Internal candidates assume they already know what a job involves and often have strong opinions about the competencies required to do it. If the successful candidate doesn’t appear to have them – at least as far as rivals are concerned – it can generate great dissatisfaction with a potentially toxic side order of backbiting and a drop in morale. The key to ruffling as few feathers as possible is high-visibility succession planning. This is a process that emphasises opportunity and makes it clear that, if someone misses out on one job, there will be other opportunities within an approximate timeframe. In addition, if potential candidates need to upskill to apply for these positions, they will be helped to do so. This helps avoid internal competitions turning hostile. By Sue Shellenbarger. Originally published in The Wall Street Journal on October 17, 2018. If career planning at your office is starting to resemble an episode of “Survivor,” you’re not alone. More employers are sparking internal competitions by posting job openings online and encouraging interested employees to apply. The internal horse races that ensue open up new career opportunities for many, but also risk leaving angry, dispirited runners-up in their wake. “It’s a really great thing” if these rivalries give employees fairer, faster access to new opportunities, says Minneapolis executive coach Kevin Cashman. “But they create a bit of a monster” if employers fail to provide career-planning help and support for those who lose out, says Mr. Cashman, global head of Korn Ferry’s CEO development practice. By Kevin Cashman, originally posted on his Forbes blog, Pause Point on September 14, 2018. In our work with CEOs and senior leaders, there is one enduring tenant: Engage or die! A 2016 Korn Ferry research study found that the most highly engaged organization achieved 4.5 times greater revenue growth than the lowest engaged firms do. The world belongs to the most engaged. Human energy fuels drive and human engagement harnesses that drive. Entrepreneurship may be the purest form of leadership. If leadership adds value by going beyond what is, then entrepreneurs express this tendency at the most essential level. What makes an entrepreneur an effective one? And what do these most effective entrepreneurs have to teach corporate leaders? While we work with mainly corporate CEOs and senior leaders for the world’s largest companies, I have a soft spot and admiration for these enterprising, risk-stimulated types. Granted, I was an entrepreneur for 25 years, so my bias and appreciation for business creators is no accident. A massive growth in entrepreneurship is taking place across the U.S. with more than 500,000 becoming business owners every month, according to Vishal Agarwal. Vishal should know, as a venture capitalist he is constantly interacting and advising young founders on the challenges of startup leadership. In addition, Vishal was a former GE executive who can see the distinction between entrepreneurial and corporate leadership. Vishal Agarwal is the bestselling author of Give to Get: A Senior Leader’s Guide to Navigating Corporate Life, and has studied the dynamics of why some startups succeed and others fail. Interestingly, he sees the most successful entrepreneurs as “servant leaders,” those who serve the enterprise vs. self-serve. He has discerned several key principles that distinguish successful startup leaders.